Happy holidays and a very happy New Year to all! Welcome back to campus, Dons! Congratulations to all the USF Fall 2015 graduates! Gleeson Library would like to offer you a FREE Alumni Special Borrower Library card, normally a $50 value! If you would like to continue using the library’s resources all you have to do is apply online by February 12, 2016. At the end of 2015 I thought I would reflect on some of my library history related activities this year. I completed my seventh year of blogging on the Library History Buff Blog. It was not a great year for blogging, only 34 posts which was an all time low for me. My total posts during the seven years total over 700. My pageviews during this 7 year period total 425,000, and my official blog followers total 303 (thank you to all of my followers). It was a disappointing this year for my Library History Buff website. It is basically a dead site at this point. The site is based on the Microsoft FrontPage software platform which Microsoft no longer supports and my Internet provider also stopped supporting it this year. The LHB website which I started in March 2005 evolved from a free website offered by my Internet provider which I began in October of 2002.The task of transferring all the content on the site to a new platform is daunting for someone of my limited Web skills. I am currently exploring options for the future of the content on the site. I continue to be a collector of librariana with a special emphasis on postal librariana and have added many interesting items to my collection in 2015. I do, however, think a lot about the final disposition of my collection which has been assembled over a 20 year period of active collecting. I am an exhibitor of postal librariana at national level stamp shows and this year I developed two new exhibits for exhibition. The larger exhibit was titled “America’s Membership Libraries” and it received gold awards at stamp shows in St. Louis, Minneapolis, Milwaukee, and Omaha. The smaller exhibit was titled “Hiram E. Deats – Philatelist & Collector Extraordinaire”. Although Deats was a world renowned philatelist, he had many library connections including serving as president of the New Jersey Library Association. It received Vermeil awards (the level just below gold) at several stamp shows, but ended the year with a gold award at the Chicago stamp show. At the Wisconsin state stamp show my exhibit “Libraries and the Mail in America 1900-1960” won the Champion of Champions award. This year I stepped down as Chair of the Steering Committee of the Wisconsin Library Heritage Center, a position I have held for the last six years. I continue, however, to serve as webmaster for the Center’s website and blog, and to install exhibits of Wisconsin library memorabilia at public libraries around the state. I also help research potential nominees to the Wisconsin Library Hall of Fame. In a closely related activity I am a member of the Wisconsin Library Association’s 125th Anniversary Task Force. WLA will celebrate its 125th anniversary in 2016. To help kick of 125th activities, noted library historian Wayne A. Wiegand made a presentation at the annual WLA conference in November about his new book Part of Our Lives – A People’s History of the American Public Library. I continued this year with assisting library postcard collector extraordinaire Dan Lester with the disposition of his 10,000 plus library postcard collection. Last year I helped move over 6,000 of his library postcards to the American Library Association Archives at the University of Illinois in Champaign – Urbana. I’m looking forward to engaging in a number of library history related activities in 2016. 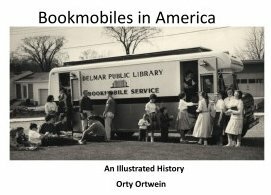 I just received my copy of Bookmobiles in America: An Illustrated History by Orty Ortwein, and I would recommend its purchase by library history buffs and especially those, like me, who have a special interest in this aspect of library service. The book was self published by Ortwein earlier this year and can be purchased for $11 from Amazon. Some of the content in the publication has been previously published online in Ortwein's excellent blog Bookmobiles: A History. Ortwein readily admits that his book should not be considered the absolute authority on American bookmobiles. Instead, he says, it should be thought of as "a fun tour of a fun topic". As could be expected from a book with "Illustrated" in its title it includes numerous illustrations of bookmobiles tied to interesting stories about bookmobiles. The book also includes stories about traveling libraries. Included in the book is a chart compiled by Ortwein that shows the rise and fall of bookmobiles in America. The number of bookmobiles peaked in 1965 at 2,000 but had dropped to 696 in 2011. The expansion of bookmobile service correlates to the infusion of Federal aid from the 1956 Library Services Act for rural library service. Also of great value is the extensive list of sources which Ortwein includes at the end of his publication. Click HERE to see my previous blog posts about bookmobiles. Also don't miss the American Libraries Pinterest bookmobile site.